Strange (yeah, not really THAT strange) how every Monday is the worst day EVER and by Wednesday or Thursday I'm ok and by Friday, well of course the world is awesome and the weekend looms large and endless. Then comes Sunday night, when I love Oliver more than I've ever loved him... but we're not gonna trek down that slippery slope. So. To remind myself, and encourage myself to keep thinking positive, I'm going to quote myself. Myself. "Right now ... I'm just going to focus on each day as it comes. And more importantly, I'm going to try my hardest not to fall into the pattern of spending every day thinking "I wish it was the weekend" even though I DO wish it was the weekend. I think that wishing away the weekdays does more of a disservice to me. Fun times DO happen during the week! Bathtimes and feedings and playtimes and rocking him to sleep are things that will happen any day of the week and those times are all special and perfect and important and I shouldn't just wish them away. Just because I didn't get to spend the whole day doing them like I would on a Saturday doesn't make them any less precious of a memory. And obviously, I don't want to lose a single one. Imma start taking more pictures during the week." YAHOO! Goal accomplished! Okay, so really Nick takes the pictures around here. But that's ok! Because they exist! I'm no longer wallowing in self-pity and feeling like I'm missing out on something because BAM. There I AM. 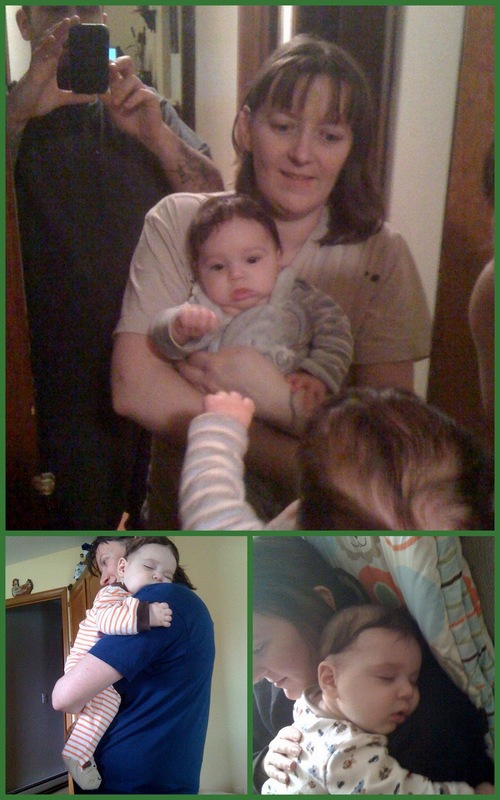 In the pictures, playing and having a good time and making him giggle and rocking him to sleep. On a WEEKDAY. Whoa. In an effort to keep up the pace and maybe get a little more perspective, please tell me: how do you keep yourself in the moment? I love my big boy and how he's sitting and playing and all that... but it's worth a shot: any tips on how I can make time slow down a little? That's a nice realization. You're lucky with Nick that he's there for you through out. I don't work at the moment, but I have to work on not wishing for the weekends for another reason... so that DH will be home to give me a hand! I do try to enjoy every second though, even when it ends in me covered in poop! Lol. Time goes way too fast.